Baby bunting costumes are a great way to dress up the youngest member of the family this Halloween and there are some really cute baby bunting costumes available to choose from. Baby bunting costumes are great if your baby isn’t mobile yet as they provide a cute and snuggly one piece outfit which will keep your baby feeling comfy as well as looking as cute as a ..........well it depends on the costume! Baby bunting costumes really are some of the cutest costumes for babies around and they come in so many different themes from Superman to Ladybugs and a lot more as well. These baby bunting costumes are really cute and will have you wanting to eat your baby up in more ways than one! These delicious looking costumes are not only great for your baby to wear, but some of them open up ideas for a mom and baby matching costume or even a group costume wearing idea so let’s check them out. First let’s look at our fruit and veg baby costumes from peas to chilis and a little banana….. The peas in a pod costume is definitely one of the cutest baby bunting costumes I’ve seen, but this could be because when I saw it was when my friend’s triplets were all wearing them. Everyone thought they were adorable! This costume just looks so snug and warm, I almost wish there was an adults one available! It comes with the headpiece and there is also a fabric fastener on the bottom to allow easy access to the diaper - always something to think about! This is some hot costume for a little baby to handle, but it is definitely what my hubby would call a funny baby costume! Personally I just love the stem on the top of the headpiece, I think it just makes the costume. According to the manufacturers the costume measures 24 inches from center front to hem which means that it has plenty of room if your baby likes to kick about abit - I know mine always wanted plenty of room in her outfits for kicking practice! As far as diaper changes go this baby Chili Pepper costume has a back flap ready for emergency changes! I love the banana baby costume, but I must admit not all babies look cute in yellow no matter how gorgeous they are. 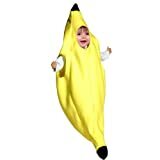 The banana costume is great as you can pop them in their own white onsie underneath it and there is plenty of room for baby to more around in his/her banana costume. The use of velcro makes this costume very easy to get on and off. What about junk food inspired baby bunting costumes? Well there are plenty of them and these are the ones that are easy to adapt to parent and child costume ideas or group costume ideas. Now I haven’t actually seen a baby wearing a hot dog costume, but I think it gives a great opportunity for a mom and baby or dad and baby costume idea. The parent can dress up as a hot dog vendor and carry the baby in the hot dog costume around. Isn’t that a cool idea for baby’s first Halloween? If you're looking for baby bunting costumes for twins then tomato ketchup and mustard are a great combination to use. You could also use this if you're going out with friends who also have a young baby. The adults can dress up as hot dogs, french fries and/or burgers - this would create a seriously mouth watering family dress up 'look'. 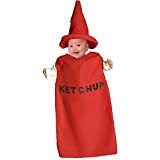 I think these are great costume ideas, although I have also seen baby bunting tomato ketchup costumes which mimic a ketchup sachet, the most common one I've come across is of a Heinz Tomato sauce sachet. We all think our baby's are pretty special, now we can show everyone that they really are Super Babies with these Superhero Baby Costumes! 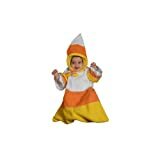 A classic Halloween baby bunting costume has to be this cute candy corn costume. Candy corn is synonymous with Halloween which means that this outfit is a perfect one for your baby’s first Trick or Treat outing. This outfit really does look snuggly and warm which is what you need for your baby in October, it also comes with a cute little hat and personally I think it will look awesome in photos too! What should you dress your baby in for their first Halloween? 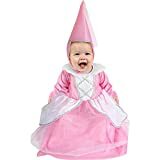 I have some classic Baby Halloween Costumes available for you to choose from from Candy Corn through to Ghosts. What father wouldn't want to dress his son up in a footy costume? My hubby would've dressed our daughter up in the first football costume if he'd seen it when she was a baby! As I've said I love the Ladybug costume, but the butterfly baby costume is also pretty special. Below we cater for the dad who's into baseball and of course a princess costume because aren't all baby girls someone's princess? Have you ever seen such a great collection of baby costumes? There's just something about the baby bunting costumes that make even the most hardnosed people go 'ahhh,' basically they're just cuter than the romper style of costume. Baby bunting costumes also come with the added bonus that baby will be happier in them as he (or she) thinks he's wrapped up in his blanket - not dressed up in a costume!